On Sunday, July 8th, 2018 at about 1:00 a.m., officers responded to the intersection of 15th and Roosevelt to an injury accident. One of the vehicles had reportedly rolled as a result of the accident. They discovered that a gray 2007 Infinity, driven by a 37 year old male was westbound on 15th Street when a red Chevrolet Colorado, driven by a 30 male, ran the stop sign for northbound traffic at Roosevelt Avenue in front of him. The Infinity was unable to stop in time and struck the Chevy in the passenger side, causing it to roll over. Both the driver of the Infinity and the passenger, a 23 year old male, were injured in the accident and transported to Southwest Medical Center by EMS. The driver was later taken to a Wichita hospital for further treatment of his injuries. The driver of the Chevrolet received only minor injuries and did not require any treatment. 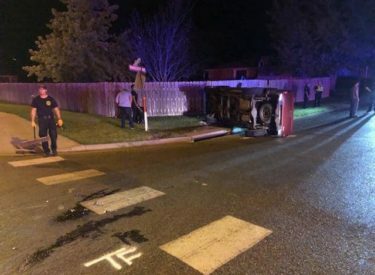 The investigation at the scene showed that he was under the influence of alcohol at the time of the accident. A small amount of marijuana and drug paraphernalia was seized from his vehicle. Both vehicles were towed from the scene. The driver of the Chevrolet was arrested for aggravated battery x 2, DUI, possession of marijuana, possession of drug paraphernalia, and run stop sign. An affidavit was forwarded to the Seward County Attorney’s Office seeking formal charges.